Valve packing is a string sealant that is used to prevent liquid leaks in valve stems and stuffing boxes. 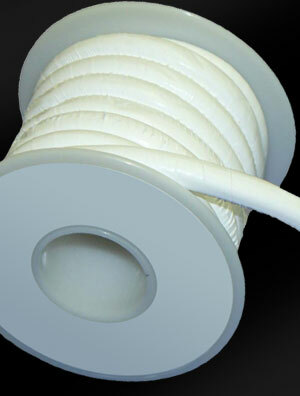 These strings are impregnated with PTFE ® or graphite to make them pliable, self-lubricating, and durable. Valve packing is designed to conform to almost any surface and is an essential component of watertight mechanical systems. Valve packing is affordable, dependable, and very easy to install. There are two main types of valve packing materials. The most widely-used is PTFE packing, which can be used either as "virgin" (pure), or loaded with other materials such as glass fiber, silica, and carbon. The other type is graphite packing, which can withstand high temperatures of up to 1000 degrees Fahrenheit. Aside from leakage prevention, valve packing protects valve stems and stuffing boxes from wear. It can last for a considerable amount of time. Most industries consider it practical and cost effective to keep valve stem packing in stock at all times to fix leaking valve stems when they occur. Valve stem packing is a useful sealant for any industry that requires liquid transport. It is widely used in house plumbing, water and chemical transport systems, and boat motor systems. Any assembly that has valves, faucets, and stuffing boxes relies on valve packing for leakage prevention. At Hoffmeyer, we understand your need for safe, reliable, and watertight mechanisms. We offer the best valve stem packing brands available today. Our valve packing is boxed in continuous lengths for easy storage and use. With our 90 years of experience in providing high-quality packing and seals, you are guaranteed to find the best valve packing options at Hoffmeyer. Contact our representatives today and request a quote for our current valve packing offerings. Our trusted experts will ensure you get the best valve packing types, sizes, and brands to fit your needs. We can also help you find the adapters, accessories, and custom solutions you may require.